Samsung’s Notebook 9 Pro 15 is the first 15-inch* Windows 10 convertible to feature a Wacom EMR pen. And like its close relative the Samsung Galaxy Book, this laptop should leap to the top of the consideration set for anyone looking for a premium inking experience. PC makers have been steadily migrating to active pen tech since 2013 and the last generation of EMR laptops topped off at 13 inches. The only other 15+-inch EMR Windows 10 device on the market is the Wacom MobileStudio Pro. While I’d still recommend that tablet to the most discriminating artists, the Notebook 9 Pro is a better choice for those looking for a general purpose PC. The $1300 convertible features a Core i7-7500U processor, a Radeon 540 GPU, 16GB of RAM and 256GB SSD. The only disappointment is the 1920x1080 resolution IPS display, a significant dropoff vs. the stunning UHD SuperAMOLED display found on the Galaxy Book. According to MobileTechReview, the N9P display offers 334 Nits of brightness and full sRGB, 77% Adobe RGB color gamut. It also has an outdoor brightness mode accessible via the Samsung Settings app (above) that will blow out your eye sockets while indoors. 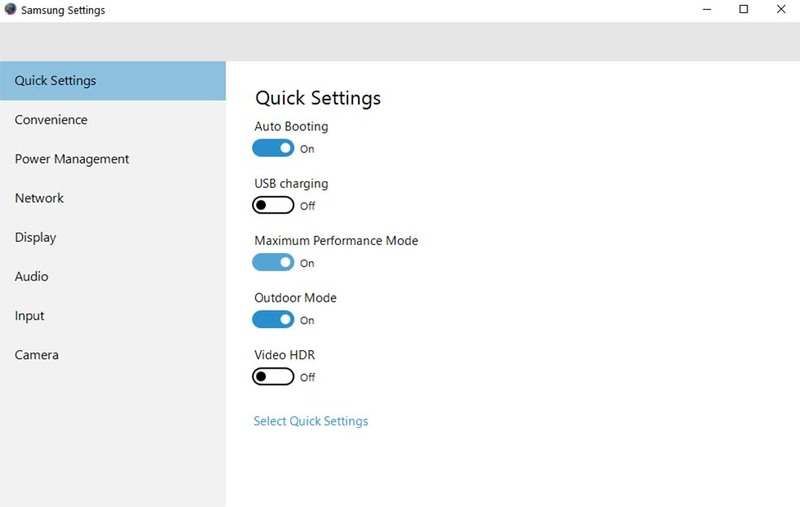 The settings app also has several other convenient features for screen color, power management and booting but unfortunately lacks the pen pressure control option found in the Galaxy Book version of the app. Samsung Notebook 9 Pro 15 is nearly one inch narrower than the Lenovo Yoga 720 15. Weighing 3.79 lbs. and only 17mm thick, the N9P is very light. Compared to the Lenovo Yoga 720 15 (a 15.6 inch device), the Samsung is appreciably smaller: ¾-inch narrower and 3/16 -inch thinner. It has a smooth aluminum finish that remains cool to the touch even after hours of extended use. Fan vents are located along the bottom of laptop but the N9P never got too hot while using on my lap. Heat is vented onto your body when cradled in tablet mode, but since fans very rarely kicked on, I never noticed them or any significant heat. Speakers grills are also located on the bottom of the device and while the N9P offers decent audio levels, they sound a bit tinny. The Windows Hello camera works very well and reminds me how much I missed it on the Galaxy Book. The laptop also offers a convenience mode that turns on the device the moment the lid is open, another nice time saver (though it always gives me the sensation I forgot to turn it off at the end of my last session). The only feature of the full size keyboard I didn't like is the raised lip around the keyboard frame. The backlit full-sized keyboard is roomy and comfortable, with plenty of space to rest your hands alongside an extra-large trackpad. As these things go, the trackpad isn’t the most responsive I’ve encountered on a Windows laptop, but it’s not the worst either. There’s a small lip all the way around the keyboard base that I found to be a little uncomfortable under my wrists. In tablet mode, the display rests solidly against the keyboard back, with none of the play I found in the Yoga 720. Side bezels are very small, about ¼-inch, but I didn’t have any trouble invoking side swipe gestures. Although its 16:9 aspect ratio isn’t ideal for drawing, the display’s vertical height of 7 3/8-inches doesn’t feel too cramped or narrow in either landscape or portrait modes. The notebook has one USB-C port, two USB 3.0 ports, HDMI, 3.5mm audio and a microSD card slot. The power button located along the right edge of the laptop protrudes a little bit and several other reviewers have complained that it is too easy to turn on or off accidentally. Although it’s not a deal breaker, I’ve already turned off the machine a couple of times while handling it. Battery life is decent for a system with a discrete GPU, offering at least 6 hours of battery in balanced mode at 50% brightness. Fully charging the battery takes about two hours. The Radeon 540 helps the N9P perform exceptionally well in benchmark tests (left), despite its dual core processor. The Samsung laptop beat the Yoga 720 in four out of seven PCMark 10 tests and two of six 3DMark tests. The Lenovo is still the overall performance champ but the N9P is a genuine contender for most creative tasks.. The Notebook 9 Pro doesn’t ship with a full-size S-Pen like the one that ships with the Galaxy Book. Instead it includes the siloed stylus version that triggers the Air Command panel (left) every time you pull it out of the silo. Air Command offers a series of Samsung tools that reproduce functionality already in Windows 10, such as creating notes, screen clipping or screen annotation. Hover-clicking the pen button will also invoke the Air Command panel. Holding down the button while inking will erase. The version of Samsung Settings currently available for the N9P does not have any pen options, so it is impossible to disable the Air Command panel or, more importantly, adjust the S-Pen’s pressure sensitivity. The Wacom Feel driver available at the time of this review (7.3.4-36) is not compatible with the Notebook 9 Pro. It’s convenient to have storage silo for the S-Pen but the toothpick stylus isn’t very comfortable for prolonged inking sessions. Besides being too short and skinny, the stylus has now been flattened to 1/8th-inch thickness (see below). You’ll no doubt want to pick up a full-sized S-Pen, a Staedtler Noris Digital or one of the myriad of EMR tablet PC pens that will work with the laptop. The Notebook 9 Pro's S-Pen (left) is almost flat. The full-size S-Pen and Staedtler Noris Digital are acceptable, but much narrower than the Wacom Bamboo Stylus Feel (far right) which is the width of a standard pen. Although I was disappointed at the lack of pen settings currently available, I was very pleasantly surprised by the tilt recognition from even my oldest EMR pens like the one that shipped with the first- and second-generation Surface Pro. Neither S-Pen nor the Noris Digital required calibration but the older pens’ cursors all fell several pixels below and to the right of the pen tip (above, right). Because it’s a relatively small offset, I assume this can be corrected via the calibration tool found in the Windows 10 tablet PC settings. I decided not to verify this because it wasn’t practical to switch back and forth between calibrations for this review. The S-Pen offers 4096 pressure levels but I didn’t feel like I was missing much sensitivity when I switched to those older pens either. The tips on the new generation pens are significantly thinner than before. The silo pen has a soft tip similar to the one found on the Noris Digital. This tip offers a bit more friction on the N9P glass. The full-size S-Pen has a harder tip which I’ve grown to prefer because it glides more smoothly. Naturally the softer tip is quieter on the glass but neither is exceptionally loud. All the strokes in this image were created with the same size brush. Variations were all created with pen pressure. Without being able to turn down pressure sensitivity globally, I had to rely on the pen pressure settings in Clip Studio Paint (see above). These were sufficient to achieve very light lines which I hadn’t been able to accomplish with the default settings in the Galaxy Book. I assume that the Samsung Settings app will eventually offer some pen control as it does on the Galaxy Book or that the Wacom Feel driver will eventually be compatible, but there are no guarantees at this point. As I mentioned in my Galaxy Book review, the RadialMenu utility can be used to remap pen button if that’s mission critical. On my two-button pens, the Fujitsu T-5000 and Axiotron Studio Pen, the side switches had no function by default. Erasing was only possible using the end cap eraser button. I can’t say whether RadialMenu can change this behavior. Given its dual core processor, limited resolution and lack of pen features, this Samsung isn’t for everyone. Versus other* 15.6-inch pen-enabled devices, I still recommend the Lenovo Yoga 720 with GTX 1050 and UHD display for power users. And the Wacom MobileStudio Pro 16 remains the best option for full-time artists. But for sketchers and hobbyists who won’t miss the slightly lower horsepower and appreciate an exceptional, roomy ink experience, it’s hard not to like the Notebook 9 Pro 15.